Stefanie Beyeler is a talented Graphic Designer living in Thun, Switzerland. 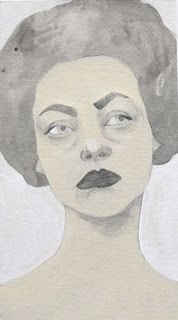 She recently included one of my drawings in an Etsy treasury that she curated. I want to share a few of her beautiful works with you. The two drawings below are from a series in black and white, her grey ladies, and they are available on her Etsy shop Beyeler. Below is a work from her website. 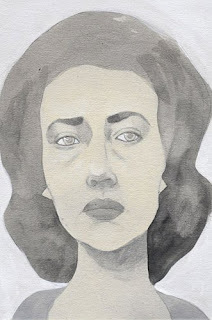 "I bought a book from 1936 in a thrift store with 500 self portraits. So few of them are made by women, and I was wondering how women would have had the time to do arts when housework was even more time consuming than now. 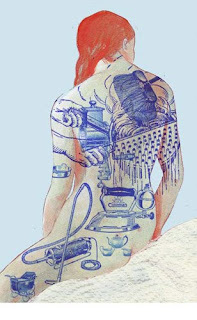 So I put those pictures of old household stuff like tattoos over her body. And she's sitting on a piece of scanned household tissue." Stefanie has a blog for her illustrations and another blog that she started with her sister, Natalie Springhart, a journalist living in Breisgau, Germany. 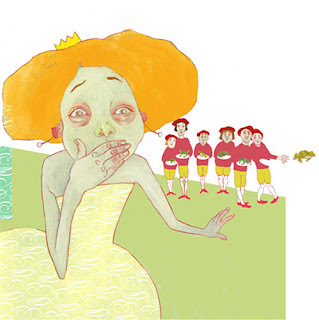 Together, in The Princess That Wouldn't Eat, they are creating a fairy tale story about a princess, who first becomes anorectic and then bulimic. Speaking of princesses and fairy tales ... Three Nuts for Cinderella is a Czech-German fairy tale film from 1973. In this version, Cinderella is more independent and a bit of a tomboy. Her wishes are granted by dropping three nuts to the floor. I remember watching it as a kid and loving it. There are film clips with English subtitles on YouTube if you're interested in seeing more. Thanks Kim, isn't this the best movie ever?